All transactions are safe and secure with a reliable history in online purchasing behind each of our associates. Buy the Michael Myers Face All Over t-shirt to own Halloween clothing and merchandise. This design for the famous slasher movie features Haddonfield's resident butcher Michael Myers. He literally butchers the residents of the community with a kitchen knife. The front of this Michael Myers t-shirt displays his masked face, which still haunts many of the people in the Haddonfield area. The design on this Halloween tee also features the Halloween logo in orange font near the bottom. This piece of merchandise is available in men's sizes and is being sold by a limited number of stores. 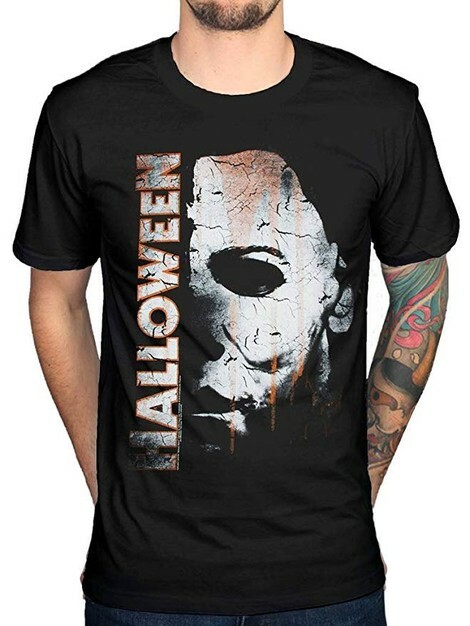 In addition to the Michael Myers Face All Over tee above, browse the Halloween Clothing Gallery for more apparel like men's and women's clothes, kids shirts or hoodies.